Summer has been hectic but once school starts up again, summertime will feel easy. Since I am a foodie and love to cook, my family has gotten spoiled getting homemade meals most evenings. I do pray one day they will realize just how lucky they are. Needless to say I am not one that is afraid to take short cuts, including picking up a Rotisserie chicken and serving it as it is. However, there are so many ways you can change up a rotisserie chicken to create a “homemade” meal in minutes. 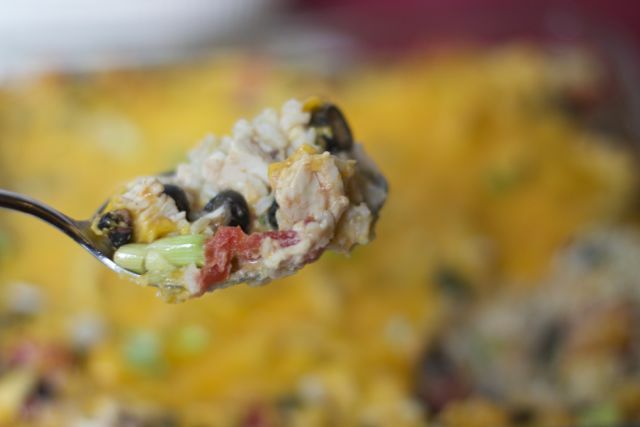 Our family loves Tex Mex so we made a Mexican Chicken Rice Dish that uses mainly canned goods, minute brown rice and chopped up rotisserie chicken. Make it a day ahead or while you are heating up the oven before dinnertime, either way I am sure your family will love it. 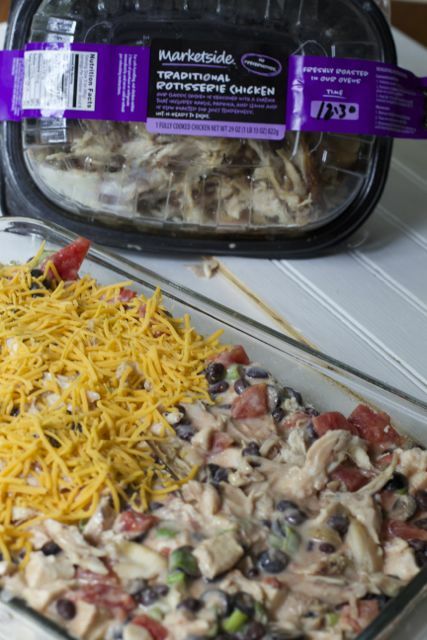 If the day has you running errands at Walmart, be sure to pick up a fully cooked rotisserie chicken or two, as well as the other ingredients and you are half way done with your dinner for tonight. 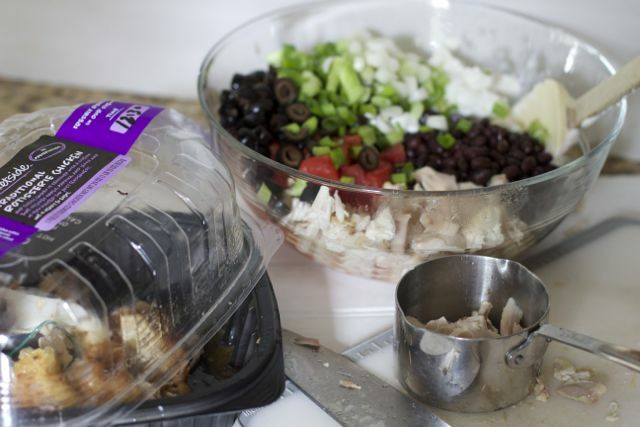 While the rice is cooking in the microwave or use leftover rice from Chinese take out, cut up the chicken and dump the other ingredients into a large bowl. 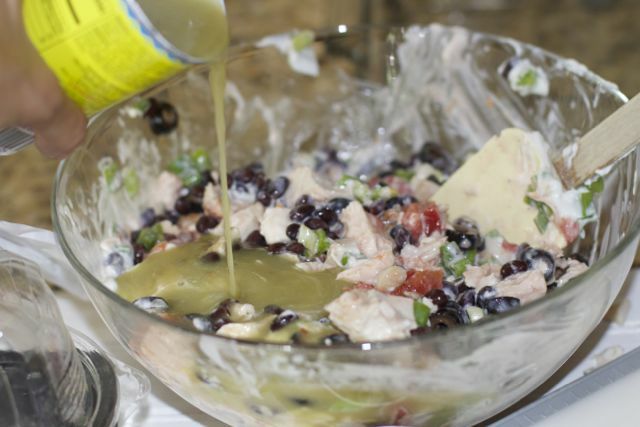 Pour over the green enchilada sauce and stir to mix the ingredients evenly. Layer the Rice then the chicken mixture. Top with Cheese and either refrigerate for later or bake until the chicken casserole is heated thru and the cheese is nice and melted. Serve warm with some cut up fruit or a green salad. Be sure to look for more Effortless Meals at Walmart, they are convenient to purchase, help provide healthy, fresh options for dinner during back-to-school, and create a positive mealtime experience for your family. 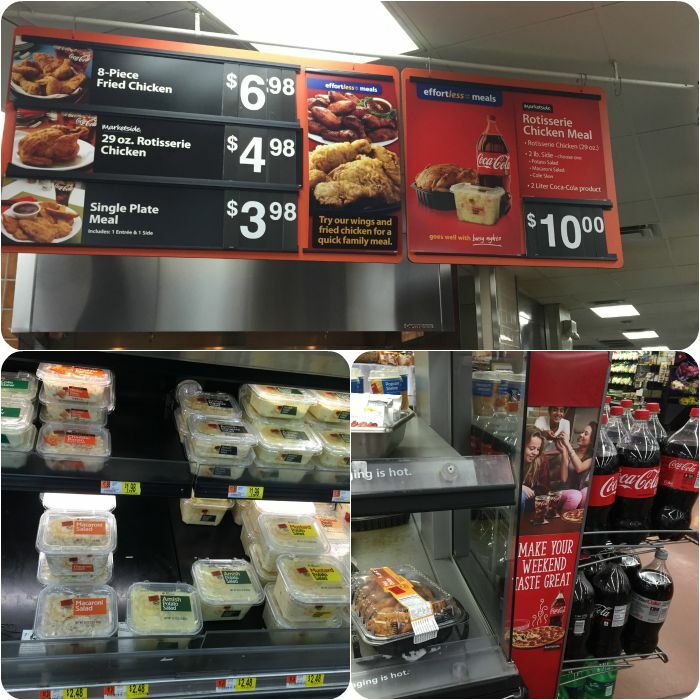 The signage at Walmart makes it easy for people to find what to make for dinner with little effort and all the items that went with our meal was in one place. Makes it super easy! Rotisserie Chicken Meal: Rotisserie Chicken (29 oz. ), 2 lb. 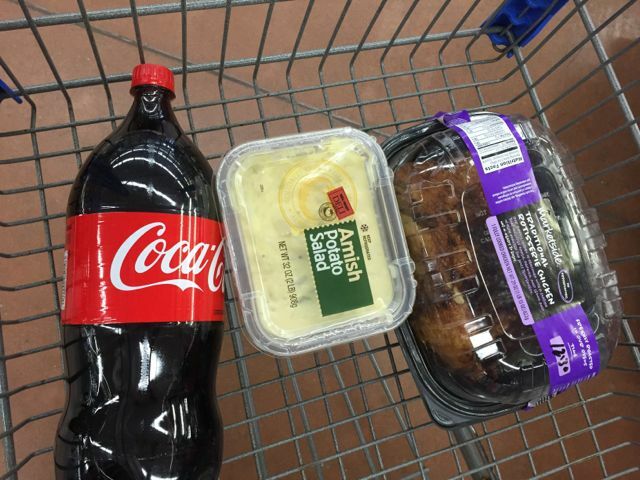 Side (Potato Salad, Macaroni Salad, or Cole Slaw), and 2 Liter Coca-Cola product. Pizza Meals: 16″ pepperoni pizza or 16″ five cheese pizza and 2 Liter Coca-Cola product. You can also easily pick up the Marketside pizzas and grill or bake them as you are getting back into the back-to-school routine. While we did not serve the potato salad we will have it for another meal later in the week. For dessert we made Coke Floats. The kids and hubby could not have been more satisfied and it didn’t take much effort on my part either. A win-win for our family for sure. Since the chickens are available all day, pick up a few extra and make some of these other amazing weeknight dinners using a Rotisserie Chicken. Preheat oven to 350 degrees. Coat 13x9x2 inch baking dish, we use glass, with nonstick cooking spray. Cook rice according to package directions. Transfer to baking dish. In a large bowl, combine all the ingredients except the cheese and stir until mixed well. 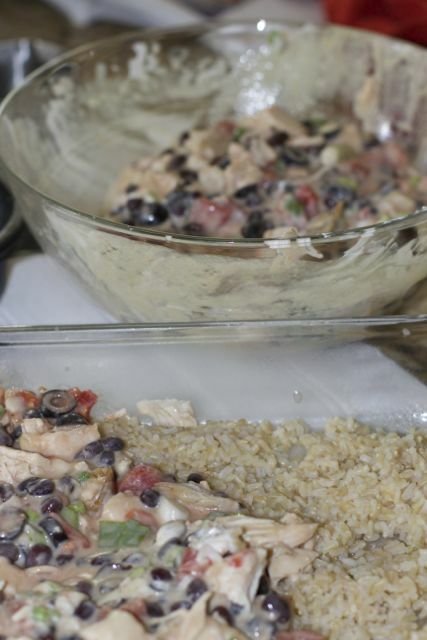 Layer the chicken mixture over the rice and then sprinkle with the cheese. Bake 20-30 minutes until heated thru and cheese melts. If you make this ahead, allow the casserole to sit out while you preheat the oven. Be sure to check out more delicious effortless meal inspiration. 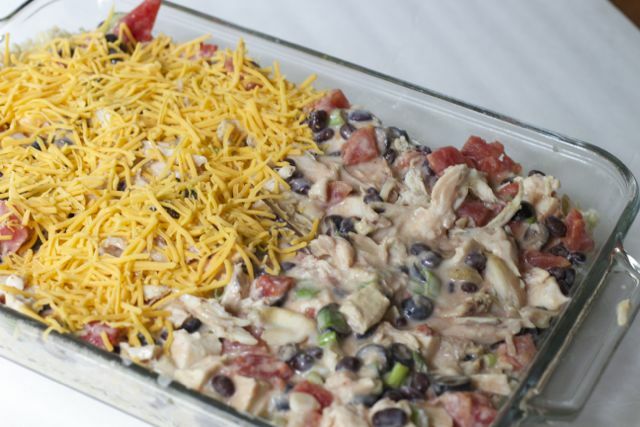 How do you like to use rotisserie chicken for weeknight dinner ideas? So many “fast” dinners are also not very good! this list using rotisserie chicken all look AMAZING, this rice dish looks so good! perfect for getting back in the swing of things with school starting. Thx for including my salad in your round up! they are really a great meal starter when you need something quick. I have heard so many great things about rotisserie chickens. I’m starting the think I need to pick one up during one of my grocery trips! 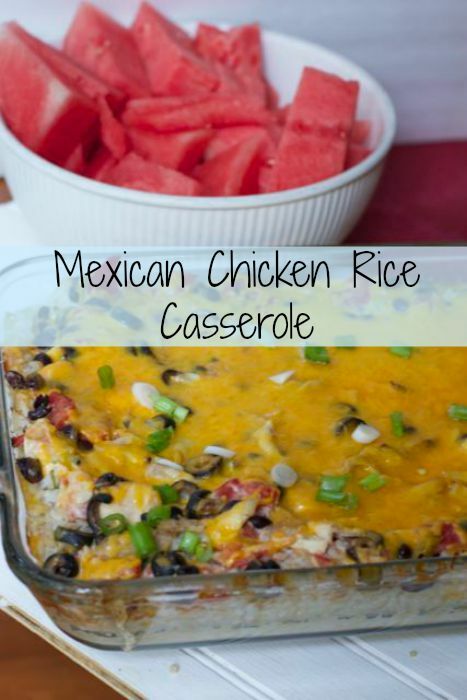 This chicken rice casserole looks so yummy! We eat a lot of chicken in our household so I am always trying to find different ways to use it. Thanks for sharing the other links as well! 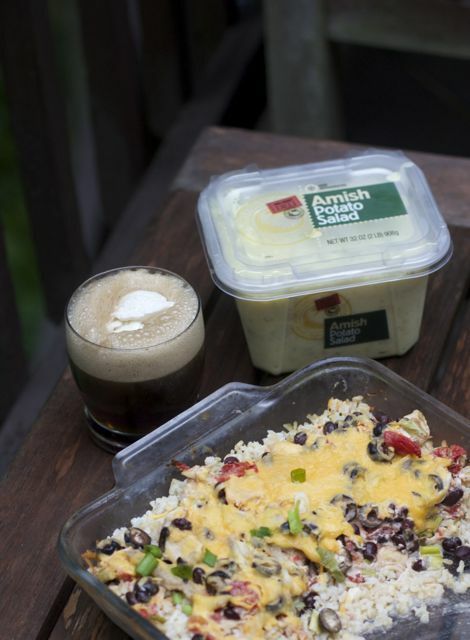 I want to try the White Bean Chili with Chicken and Sweet Potatoes from Floating Kitchen too! Some great ideas for quick and easy weeknight meals!! 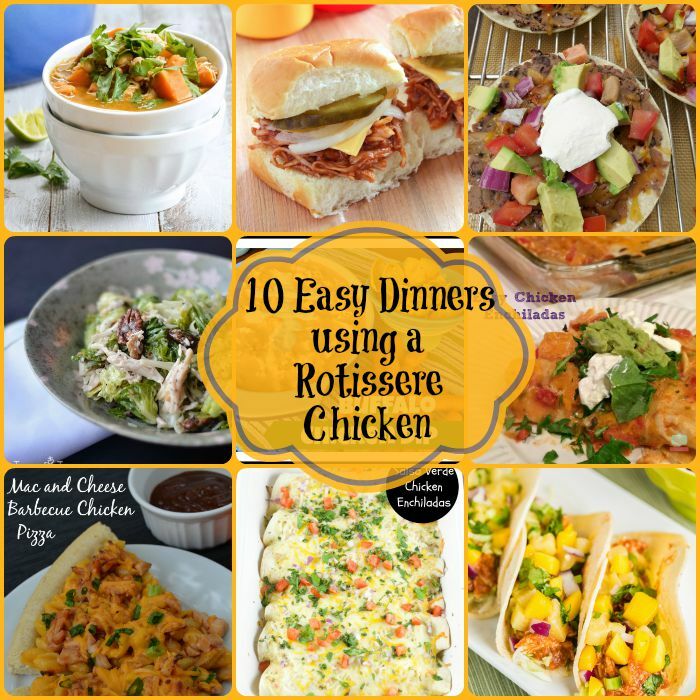 What a grab round-up of easy rotisserie chicken dinners. I buy rotisserie chicken often because of the ease of putting dinner on the table. Yum! I need to try this tonight. I think I have everything to make it! Ah this is seriously GOLD! 😀 I don’t really like rotisserie chicken on its own, so these are great ideas! One would think a SAHM has all the time on her hands but we are busy too..
Hope it comes in handy this fall. 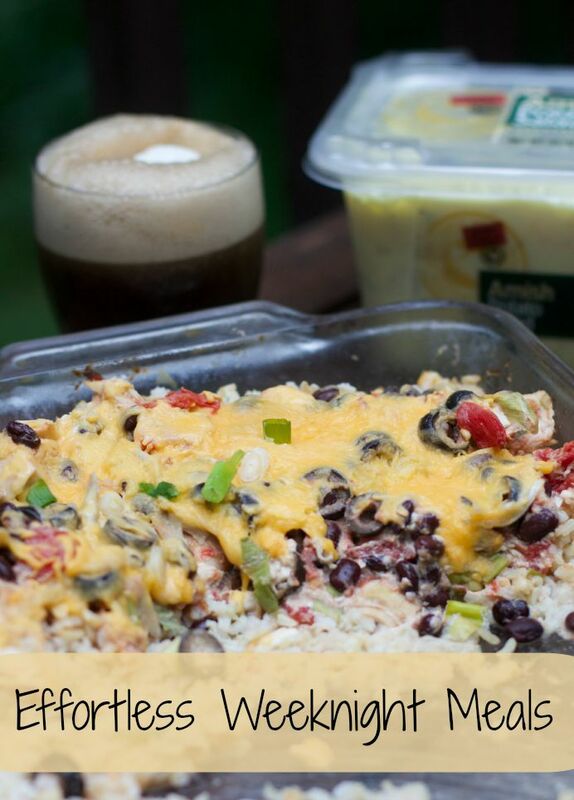 Thanks for sharing your Mexican Chicken Rice dish. We love rotisserie chicken in my house and I am always on the hunt for recipes for the leftovers. These are great options. I am a stay at home mom so I have a little more time to spare for cooking but sometimes I just want something different and quick. Great ideas! 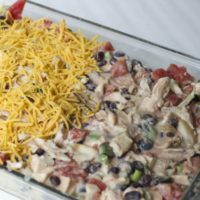 I am all about finding dinner ideas that don’t require a crazy amount of work and using a rotisserie chicken definitely helps cut down on prep time…which is great especially once school starts!